Modular, maintainable, and moveable, our unbreakable products eliminate the cost of broken concrete replacement, and reduce trip-and-fall risk. Fast, clean installation lowers labor costs and resource requirements. Our advanced materials result in a high return on investment. Long recognized as the pioneer in “green” pedestrian pavement, our products are pervious and offer many environmental advantages, including storm water management, reduced heat island effect, 100% recycled content, urban tree preservation and low carbon footprint manufacturing. Our products contribute to up to six LEED credits. Walking is an important part of maintaining an active lifestyle. Our products enable pedestrians to walk on safe, comfortable ADA-compliant sidewalks that aren’t broken or uplifted. Whether for seniors, safe routes to school, sidewalks along rural roads, or everyday urban sidewalks, pedestrians want to walk on our sidewalks. Jose manages TERRECON, Inc.’s logistics, data management, and customer support. Richard is the nation’s recognized leader in urban sidewalk solutions. 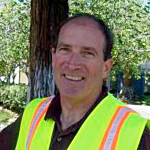 Gordon Mann has over 34 years of experience in urban forestry management. We are proud to announce an agreement with Houck Design, the #1 disc golf course designer in the world, whereby HouckDesign will specify and promote TERREWALKS® as a superior among all the alternatives for tee pads. HouckDesign believes TERREWALKS® will benefit its clients and players because it is easy to install/re-locate, permeable, 100% recycled content, durable, and cleanable.